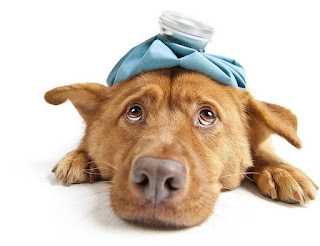 Canine influenza (also known as dog flu) is a contagious respiratory disease in dogs caused by specific Type A influenza viruses known to infect dogs. These are called “canine influenza viruses.” No human infections with canine influenza have ever been reported. There are two different influenza A dog flu viruses: one is an H3N8 virus and the other is an H3N2 virus. Canine influenza H3N8 virus originated in horses, spread to dogs, and can now spread between dogs. The H3N8 equine influenza (horse flu) virus has been known to exist in horses for more than 40 years. In 2004, however, cases of an unknown respiratory illness in dogs (initially greyhounds) were reported in the United States. An investigation showed that this respiratory illness was caused by the equine influenza A H3N8 virus. Scientists believe this virus jumped species (from horses to dogs) and has adapted to cause illness in dogs and spread among dogs, especially those housed in kennels and shelters. This is now considered a dog-specific, or canine, H3N8 virus. In September 2005, this virus was identified by experts as a “newly emerging pathogen in the dog population(https://www.cdc.gov/media/transcripts/t050926.htm)” in the United States. The H3N2 canine influenza virus is an avian flu virus that adapted to infect dogs. Although H3N2 viruses have been reported to infect cats, dog flu is a disease of dogs. This virus is different from human seasonal H3N2 viruses. Canine influenza A H3N2 virus was first detected in dogs in South Korea in 2007and has since been reported in China and Thailand. H3N2 canine influenza has reportedly infected some cats as well as dogs. It was first detected in the United States in April 2015(https://www.cdc.gov/flu/news/canine-influenza-update.htm). It is not known how canine H3N2 virus was introduced into the United States. The signs of this illness in dogs are cough, runny nose, fever, lethargy, eye discharge, and reduced appetite, but not all dogs will show signs of illness. The severity of illness associated with canine flu in dogs can range from no signs to severe illness resulting in pneumonia and sometimes death. Most dogs recover within 2 to 3 weeks. However, some dogs may develop secondary bacterial infections which may lead to more severe illness and pneumonia. Anyone with concerns about their pet’s health, or whose pet is showing signs of canine influenza, should contact their veterinarian. The percentage of dogs infected with this disease that die is very small. Some dogs have asymptomatic infections (no signs of illness), while some have severe infections. Severe illness is characterized by the onset of pneumonia. Testing to confirm H3N8 and H3N2 canine influenza virus infection in dogs is available. Your veterinarian can tell you if testing is appropriate. Treatment largely consists of supportive care. This helps the dog mount an immune response. In the milder form of the disease, this care may include medication to make your dog more comfortable and fluids to ensure that your dog remains well-hydrated. Broad spectrum antibiotics may be prescribed by your veterinarian if a secondary bacterial infection is suspected. Vaccines are available in the United States for both the H3N8 and H3N2 strains of canine influenza. Your veterinarian can provide you with additional information about the vaccines and whether you should consider vaccinating your dog. Schedule an appointment with your veterinarian so they can evaluate your dog and recommend an appropriate course of treatment. More information on canine influenza in pet dogs can be found in this article: Influenza A Virus (H3N8) in Dogs with Respiratory Disease, Florida in Emerging Infectious Diseases journal, the AVMA website, and this update on the April 2015 Chicago H3N2 canine influenza outbreak(https://www.cdc.gov/flu/news/canine-influenza-update.htm).